Available as low as $18.99 per oz over spot! The Lunar Series II program from the Perth Mint is the most popular Zodiac-themed coin series in the world. Introduced in 2008, it is the second such program of silver and gold coins from the Perth Mint. Right now, the 2017 1 oz Silver Australian Rooster Coin is available to purchase on Silver.com in BU condition. Individual coins arrive in plastic capsules. Lots of 20 ship in mint rolls, lots of 100 in mint boxes. Total mintage capped at 300,000 coins for this release. Tenth release of Lunar Series II from Perth Mint. Bears a face value of $1 (AUD) backed by the federal government of Australia. 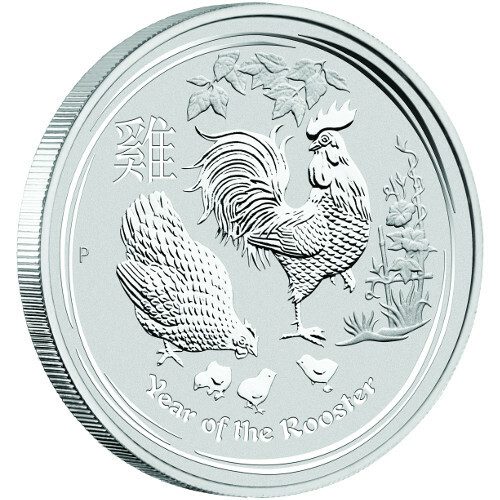 Reverse includes the image of the rooster for 2017. Obverse of the coins bears the portrait of Queen Elizabeth II. Each 2017 1 oz Silver Australian Rooster Coin in this Silver.com listing is a Brilliant Uncirculated coin. Products with a BU grade feature no signs of wear and tear, but may also feature minor flaws such as breaks in the luster, spotted surfaces, or contact marks from the coining process. 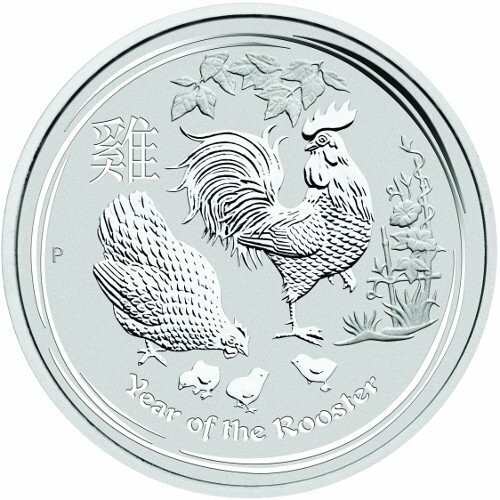 The Year of the Rooster coin is the 10th release of the Lunar Series II coin program. Introduced in 2008, it follows the popular Lunar Series I program but offers new designs in each of the 12 planned coin releases. On the reverse of the 2017 1 oz Silver Australian Rooster Coin you’ll find the image of a family of chickens, led by a tall rooster. Included in the design is a hen and three small chicks foraging among the bamboo foliage and flowers of China. Engravings includes “Year of the Rooster,” the “P” mint mark, and the Chinese symbol for rooster. 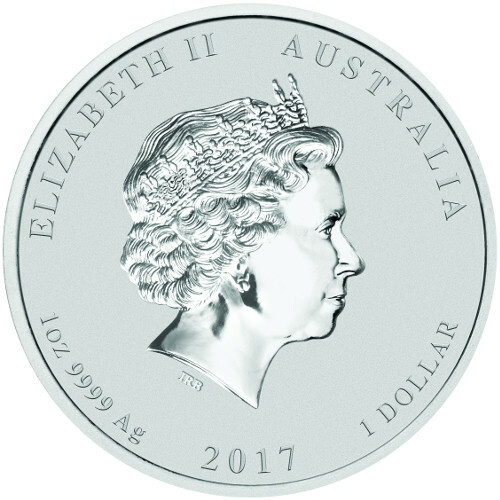 The obverse of all Silver Australian Rooster Coins bears the right-profile portrait of Queen Elizabeth II. This image is a fourth-generation depiction of Her Majesty that was created by Ian Rank-Broadley in 1998. Perth Mint is located in Perth, Western Australia and is a state-owned entity. Originally opened as a Royal Mint facility under British control, today the mint exists separate of the new Royal Australian Mint and its products enjoy legal tender status under the Currency Act of 1965. If you have any questions, please don’t hesitate to ask. Silver.com associates are available at 888-989-7223, online using our live web chat, and via our email address.